Vector borne viral diseases are of main concern for human health especially in the inter-tropical regions. In the Indochinese peninsula, “arthropod borne virus” (arbovirus) such as dengue, Japanese encephalitis and chikungunya are considered as endemic. However, a clear overview of the situation is still missing, partly as a consequence of poor diagnosis and/or research resources. Different viral transmission cycles may occur in quite all types of environments where blood feeding arthropods (mosquitoes; ticks; sandflies) and vertebrates are coexisting. 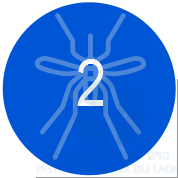 Thus, in a country like Laos, arboviruses have optimal conditions in primary forests, rural areas and in developing urban environments. Constant development and extension of human activities, including in remoted areas, may favors the emergence or the re-ermegence of arboviruses and other unknown viruses. The arbovirus and emerging viral diseases laboratory develops comprehensive studies to characterize transmission cycles that may occur in different biotopes. Human studies participate to the improvement of diagnosis, surveillance and detection of emerging viruses. Investigations on arthropods and vertebrates aim to determine the parameters of viral transmission and maintenance in natural or environments modified by human activity.